Lake Forest, Ill. - Lake Forest College women’s hockey player Courtney DeHoey (Chatham, Ont./Bluewater Jr. Hawks) was named Northern Collegiate Hockey Association Player of the Week on Monday (November 20) for her performance the previous weekend (November 17-18) as Lake Forest earned three points in the league standings at Finlandia University. DeHoey, a junior forward, brought the Foresters back from a 2-0 deficit Friday night with a pair of third period power play goals. The game ended in a 2-2 tie. The team’s leader with seven goals, six assists, and 13 goals started the scoring the following afternoon with a power play goal at the 8:18 mark of the first period. She recorded her fourth power play goal of the weekend and sixth of the season at the 12:12 mark of the second period to put the visitors ahead (4-3) for good. Lake Forest scored one more goal in the second and held on for a 5-4 victory. NCHA Players of the Week are selected by the league’s sports information director. 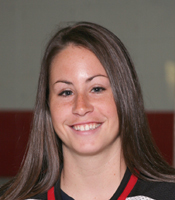 DeHoey also earned the award last week and twice in 2005-06.